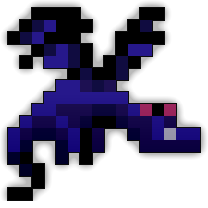 Feargus the Obsidian Dragon is the normal mode version of one of the five bosses of the Lair of Draconis. The hard mode version is Feargus the Demented. Feargus, like the other dragons, will start in the middle of the room. 1: When activated, Feargus will start firing circles of varying projectiles. Feargus will chase any players that come to close for a short while before returning to the middle. Feargus is constantly firing throughout the entire fight. 2: When at half health, Feargus will start spawning Shades of Feargus and occasionally turn invisible for ten seconds. While invisible, he cannot be hit or have status effects inflicted upon him. He still shoots the same projectiles as phase 1. As Feargus loses health, he will spawn more Shades at a time, starting with 1, then 2, then 3. When entering this room with a group, kill all the Demented Eggs before activating the boss. This makes the boss fight much easier and makes it safe when you need to back up and regenerate health. If this boss is fought first, hard mode will be activated and you will fight Feargus the Demented instead. This allows you to access the Ivory Wyvern’s lair after Pyrr, Limoz and Nikao have been defeated. Contrary to popular belief, there is no specific order in which you need to kill the aforementioned bosses as the only requirement is to kill Feargus first. As this boss is immune to Stun, Stasis, Dazed and Paralyze, abilities will not do much in this fight. When Feargus goes invisible, stay as far as possible from where he was last seen, the center of the room and the space between it. When he goes invisible, he usually bee lines to the center of the room. If a character is not careful, they will take almost a full shotgun.